The Colorado Democratic Party has teamed up with UNITE HERE!, an organization that looks like a cross between a union and a community organizer collective, to rally to increase the minimum wage to the steps of our very own state capitol at 1:00 PM today. From the looks of the RSVP point of contact, the Colorado AFL-CIO is lending a hand as well. This “Raise the Wage” rally and the notion that we need a higher minimum wage is part of the Colorado AFL-CIO’s so-called Prosperity Agenda, and another shining example of the well-meaning but wrong-headed approach that the left takes on jobs and economic security issues. Of course, the union’s agenda should not be confused with the one that Democratic politicians introduced last week. (That was sarcasm, folks, it’s clear the Dems are carrying the water for unions.) Let’s be crystal clear – this rally is about the massive wealth transfer from small businesses to unions. 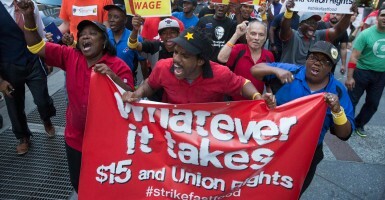 Labor unions are big supporters of minimum wage hikes. Why? Because many of their contracts are indexed to the minimum wage. Here’s an example: Assume a union welder makes $30 an hour. This is $62,400 per year. Now assume Obama is successful in increasing the minimum wage from $7.25 an hour to $10.10 an hour. The union welder will get a 39% salary increase and suddenly he’ll be making $87,000 per year! Not bad, huh? Instead of Colorado and national Democrats pounding the drum about the least amount of money that a person can make, why not focus on policies that will help empower people to make two, three, four, or more times the minimum wage? Policies such as school choice, which can provide a lifeline to poor children trapped in under-performing schools; or reducing regulation, which will free up capital to allow enterprises to earn greater profits, hire more people, and pay higher wages. As it is, the burden of complying with the minimum wage will fall disproportionately on small, family businesses already struggling to make ends meet in an increasingly complicated and costly tax, regulatory, and compliance landscape. Of course, if a higher minimum wage is instituted, the prices of goods and services will rise as well, negatively impacting our most financially-strapped families. As usual, if Democrats want to help the middle class, they are going about it all wrong. Oh, we’re just kidding. Everyone knows this rally is simply a way to raise funds for cash-strapped unions. « CONSTITUTION WATCH: Colorado Voters Prove Obama Wrong. Again.